I was giving a tour of Epcot yesterday and trying to think of a unique photo to take. 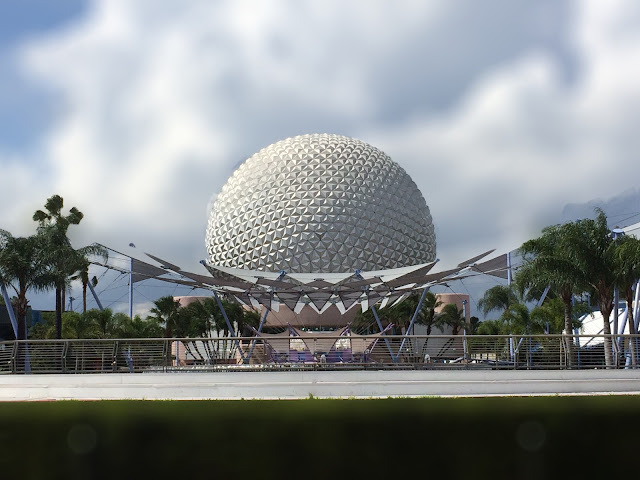 I decided to try my new SLR app on the park's icon, Spaceship Earth. I was able to "soften" the sky to make everything in the foreground really stick out. I'm having fun experimenting with the different effects that can be achieved with photography apps on the iPhone. There has been a "hidden Mickey" made of rocks at the base of the aquarium in The Seas pavilion for years. 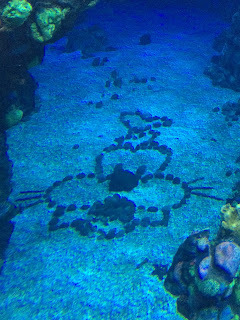 Today, while giving a tour at Epcot, I discovered a "hidden Goofy" not far from the Mickey. It can be seen on the right side as you walk down the ramp into the second floor viewing area. It was quite a surprise to come across this fun and unexpected new creation. 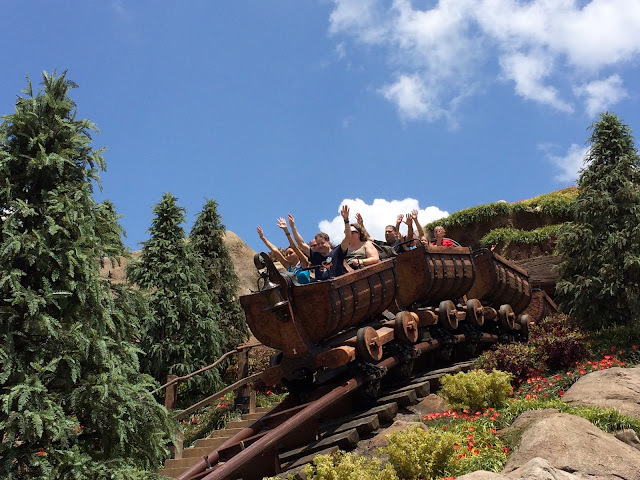 Today was the official opening of the Seven Dwarfs Mine Train. As you could imagine, it is a very popular attraction. I rode it with my tour guests, who loved it. 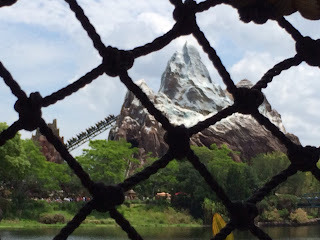 I snapped this photo of the "big" drop while our train was stopped in front of the cottage near the end of the ride. 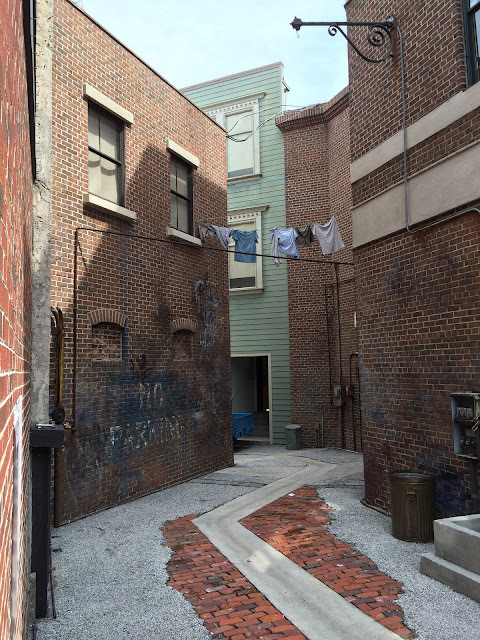 The Streets of America area of Hollywood Studios is full of very authentic details. This alley is located in "New York City" and sits between the Village Pizza Parlor and the House of Magic. You can see everything from graffiti on the buildings to laundry hanging on the clothes line. In addition to the sights, you can also hear the sounds of a big city. If you were able to walk thru the alley, you'd actually come out on the San Francisco street in Chinatown. I took this shot while giving a tour today. Today is a special day for Digital Disney World, as this is my 1,000th "Picture of the Day." 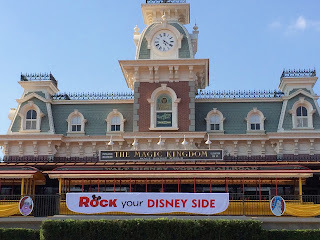 For nearly three years, I have posted a new photo that I've taken from somewhere on Disney property. When I started out, a few dozen people would take a look each day. It amazes me that over 1,500 people a week are now seeing these pics. I am truly humbled by this, and appreciate everyone who takes the time to enjoy my daily postings. 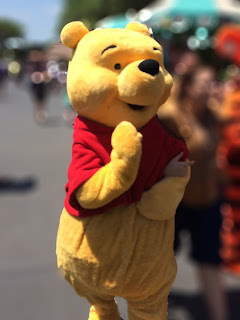 As many of you know, since starting this website, I've gone on to create WDW Guided Tours. It was always a dream of mine to make a living in a Walt Disney World related business. As I was giving a tour of Hollywood Studios today, I was trying to think of the best photo possible for number 1,000. It didn't take long before I headed to "Walt Disney - One Man's Dream." I felt It would be appropriate to take a shot of this area near the entrance. If it wasn't for this man and his vision, I wouldn't have been able to live my dream. 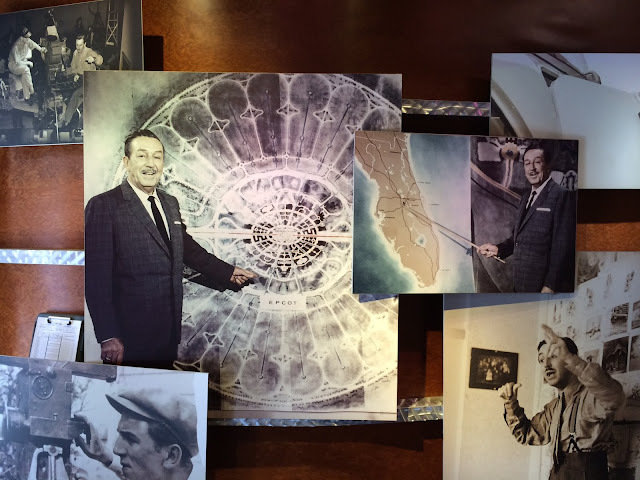 So.....thank you Walt, and a huge thanks to all of you who continue to enjoy Digital Disney World! One of my favorite spots in the Magic Kingdom is the small porch next to The Hall of Presidents with the two rocking chairs. It is typically a quiet place to take a break from the hustle and bustle of the park. I enjoyed a waffle sandwich from Sleepy Hollow yesterday while sitting in this chair. 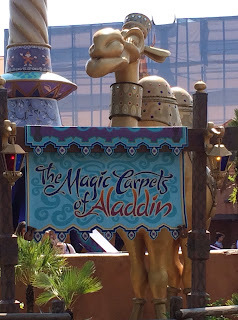 Today we say happy 13th birthday to The Magic Carpets of Aladdin. They have been flying over Adventureland since May 24th, 2001. I took this picture of the famous spitting camel today, while giving a tour of the Magic Kingdom. Today is a special day at the Magic Kingdom as it is open for 24 hours. 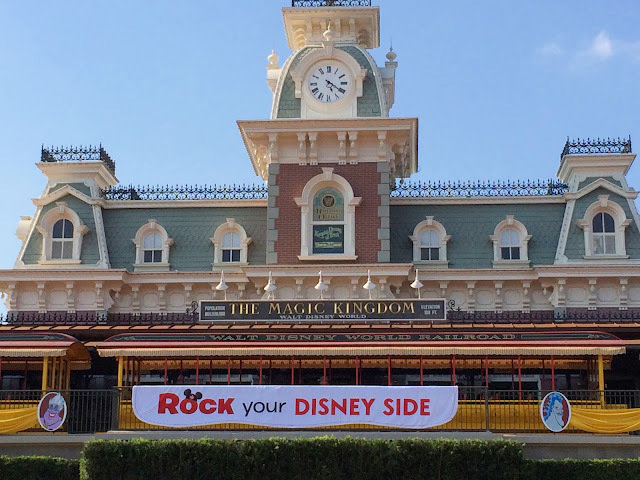 This year's event is called "Rock Your Disney Side." Similar to Halloween, many guests came dressed as their favorite Disney character. The park was open from 6:00 am this morning and won't close until 6:00 tomorrow morning. I took this shot of the entrance around 5:00 this evening. This is the most photographed spot in the world, and it is rare to see a banner hanging there. 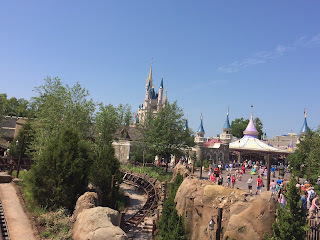 After several years of construction and anticipation, I finally had the chance to ride the Seven Dwarfs Mine Train at the Magic Kingdom today. 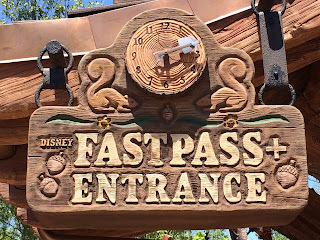 Although it doesn't officially open until May 28th, Disney had a brief "soft opening" for guests today. I snapped this shot from the bridge, which is just after the drop that faces the Be Our Guest restaurant. I took this shot yesterday, shortly after walking past the Crystal Palace. There is a long construction wall up while Disney works on filling in the moat in that area. They have this temporary "banner" hanging on the wall so that pictures of the castle from this angle still look good. 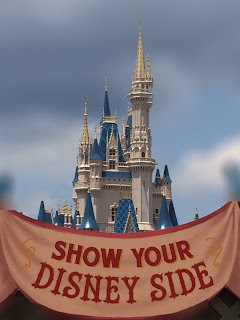 This is a very popular "photo pass " spot, and guests can stand under the banner to be part of the castle shot. Today we say happy 41st birthday to Tom Sawyer Island at the Magic Kingdom. This 3.3 acre "playground" opened in Frontierland on May 20th, 1973. A short raft ride across the Rivers of America, it is a fun place to hang out and explore on a busy day. I took this panorama today, while enjoying the Magic Kingdom. The Great Movie Ride is a classic attraction that has been entertaining guests at Hollywood Studios for 25 years. It isn't always easy to get decent pictures since you are riding in a moving vehicle and many of the scenes are quite dark. However, I was happy to get this clear shot of Humphrey Bogart and Ingrid Bergman in the Casablanca scene yesterday. This weekend marked the start of Star Wars Weekends - 2014. 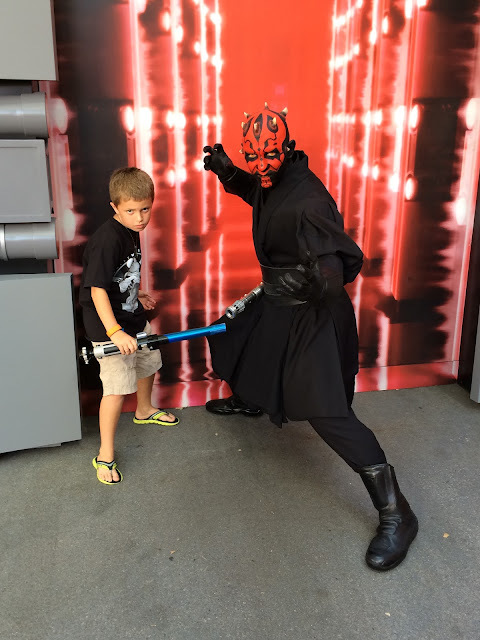 This annual event takes place during May and June at Hollywood Studios, and it is a whole lot of fun for all Star Wars fans. There is a special parade and fireworks display, stars from the movies, great presentations, and characters everywhere. We took our son for the first time today, and he had a great time. 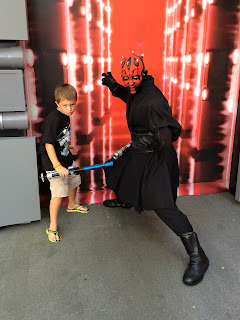 One of the highlights of the day was getting his picture with Darth Maul! Over the past year, two Starbucks locations have opened at Walt Disney World. The first was on Main Street at the Magic Kingdom and the second at Epcot. 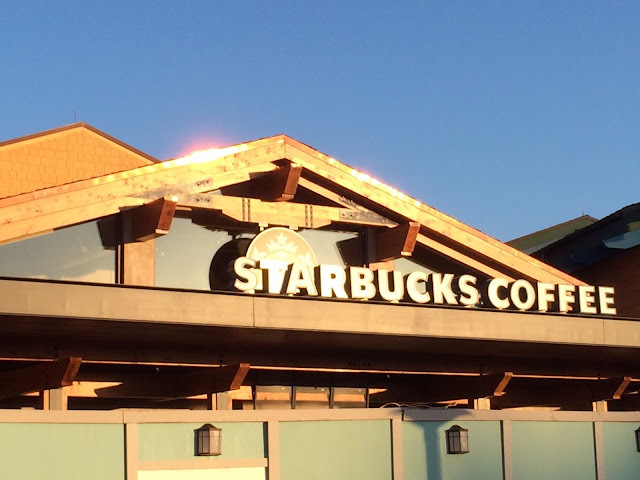 The newest location will be at Downtown Disney in front of the World of Disney store. It is scheduled to open in the near future. I took this picture today, after eating dinner at Earl of Sandwich. 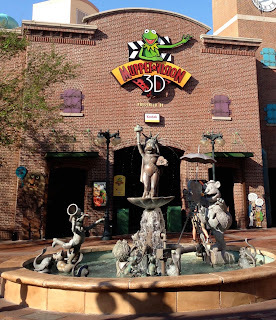 Today we say happy 23rd birthday to Muppet*Vision 3D at Hollywood Studios. It officially opened on May 16th, 1991. Unfortunately, this date is also a very sad one in Muppets history, as exactly one year earlier, Jim Henson passed away from pneumonia. 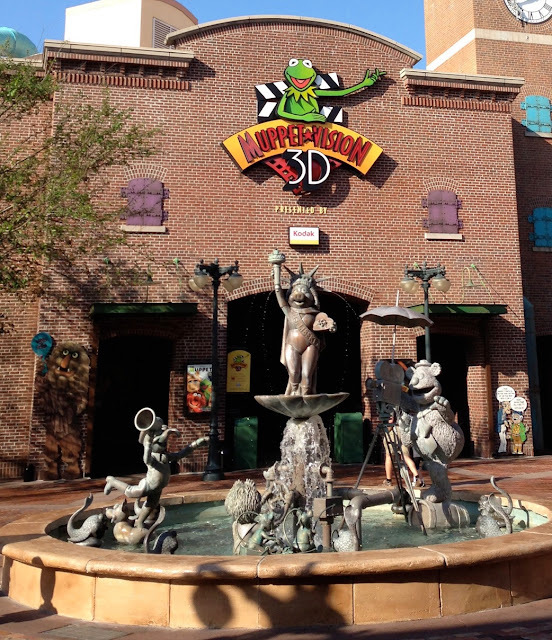 Muppet*Vision 3D would be the last project that he worked on and the last time he voiced Kermit the Frog. 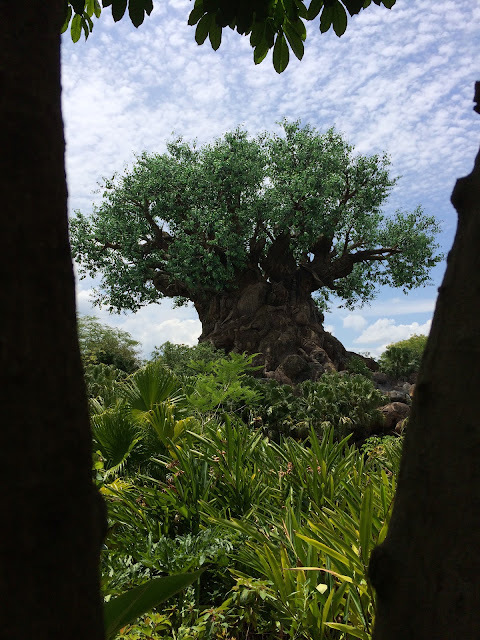 There are 325 animals carved into the Tree of Life at Animal Kingdom. Last week, I saw this shark for the first time. 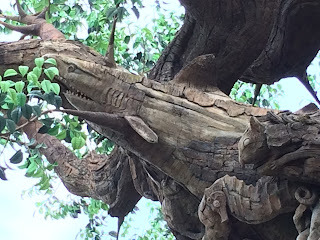 I was in the area of the kangaroo habitat when I spotted this sea creature on a limb protruding from the west side of the tree. It took sculptors nearly two years to complete the animal carvings, and the results are amazing. I have said many times that my favorite quick service spot for lunch is Flame Tree Barbecue at Animal Kingdom. This is mostly due to the views from the seating area. As I sat there a few days ago, I thought this would be a fun photo to take. Everest is one if the most photographed attractions in a Disney park, but I doubt there have been many shots taken from this angle. The Jungle Cruise is a great attraction for many reasons. My favorite aspect is the highly detailed queue. There is so much to look at and even listen to while you are waiting. There are even fun things to see after exiting the ride. 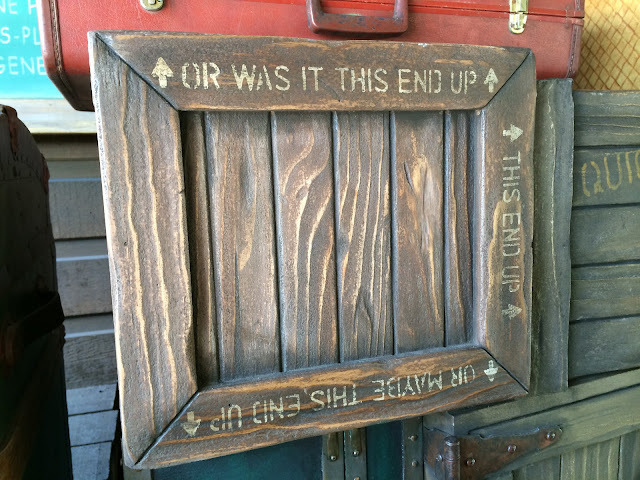 This box is part of a stack that is located on the right side of the exit. Most guests don't realize there is humorous writing on these boxes. Sticking with yesterday's "park icon" theme, I snapped this picture of the Tree of Life while walking through the Asia section of Animal Kingdom today. I was able to frame it by shooting between a double trunked tree, which created a natural border. It is fun to take unique pictures of familiar park structures. This is another one of those shots where the attraction has a "natural" frame. 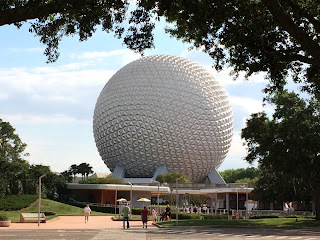 I was walking into Epcot from the Imagine parking lot when I took this photo. The trees in the foreground create a nice border from that angle. Although the Seven Dwarfs Mine Train isn't scheduled to open until May 28th, there are still plenty of great details to be seen from outside of the attraction. 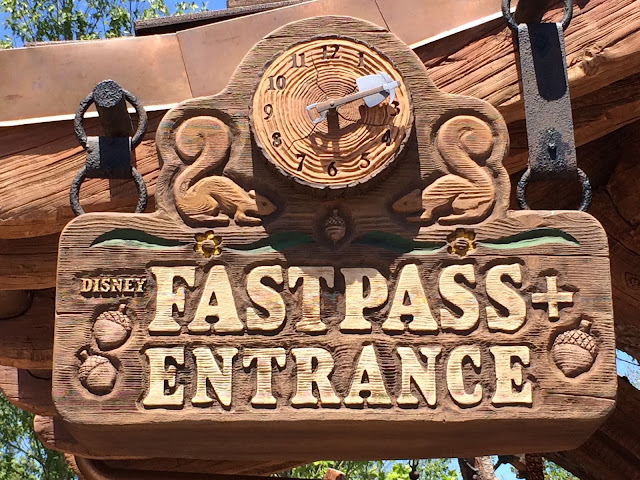 The FastPass entrance sign has squirrels and acorns engraved in it, and the hands of the clock are actually a pick and shovel. I took this shot while walking through Fantasyland last week. 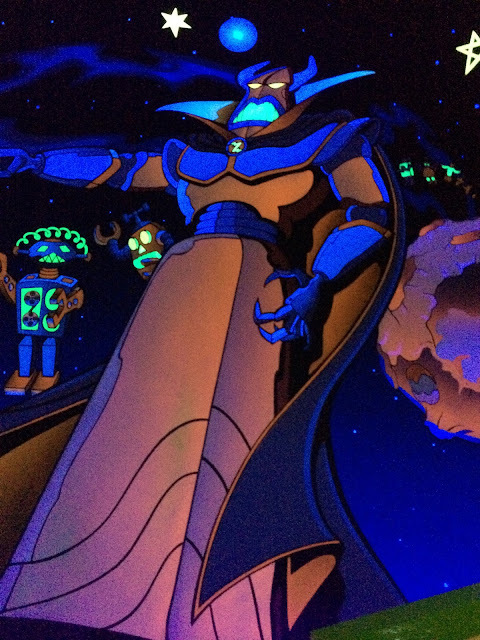 Buzz Lightyear's Space Ranger Spin is one of the more popular attractions at the Magic Kingdom. It has been amusing guests in Tomorrowland since 1998. Originally the site of "If You Had Wings," Buzz utilizes the same track as that attraction. I snapped this shot of Evil Emperor Zurg shortly after sitting down in my ride vehicle last week. It is located on the mural in the load area. 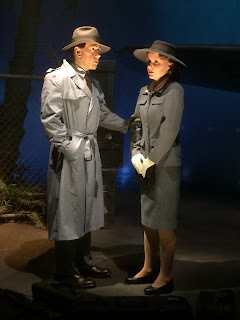 Here is one more photo from the 25th anniversary celebration at Hollywood Studios. As part of the festivities, they had a motorcade of Disney celebrities parade up Hollywood Boulevard. 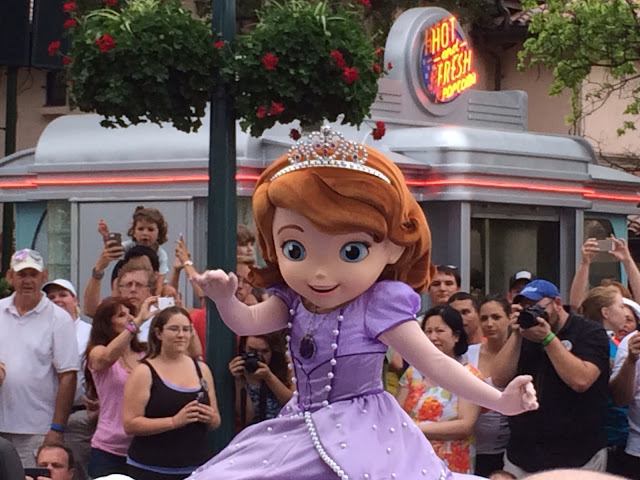 I snapped this shot as Sofia the First was looking my direction. I have recently discovered an app that allows me to convert regular iPhone photos into SLR quality. It basically blurs out the background and creates depth-of-field. 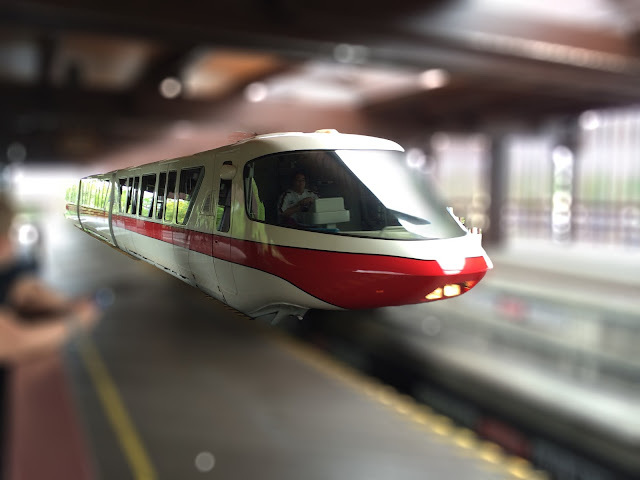 I took this shot of "monorail red" entering the Polynesian station a few days ago. After taking the photo, I used the app to enhance it's look. There are hundred's of "hidden Mickeys" throughout Walt Disney World. However, this hidden Tinker Bell is certainly unique. 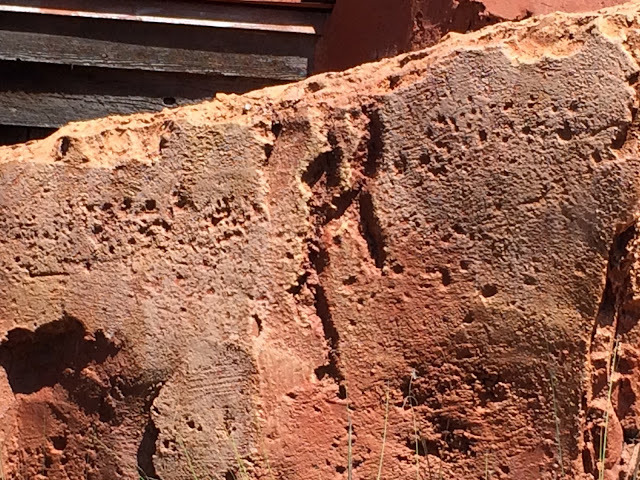 It can be found near the exit of Big Thunder Mountain Railroad, engraved into this rock. I took this shot a few days ago, shortly after riding with my son. Some of my favorite photo opportunities arise when an attraction temporarily shuts down while I'm riding. 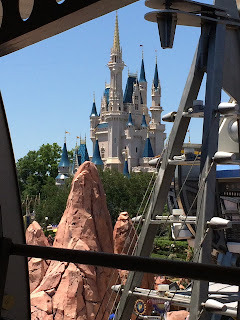 This happened while I was on the Peoplemover yesterday. I liked the way that the Tomorrowland structures "framed" the castle in this shot. As I've said in the past, the Haunted Mansion is my favorite Walt Disney World attraction. 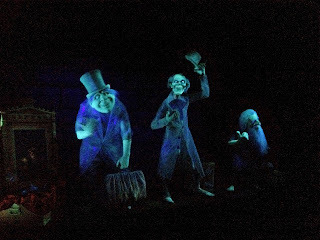 However, it is very difficult to take any decent photos here because of the darkness combined with the motion of the doom buggies. Today, our ride briefly stopped right after the graveyard scene, and I was able to grab a shot that I have waited a long time to get. Normally, it wouldn't be possible to get a clear photo of Phineas, Ezra and Gus, but today's brief pause in the ride allowed me to snap this one. 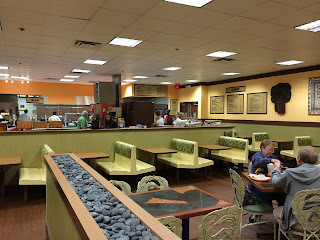 Captain Cook's is the quick service restaurant at the Polynesian. It is undergoing a major refurbishment and has been moved to a temporary location. 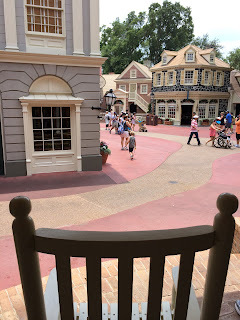 It is actually in a space that was used as a break room for this resort's cast members. 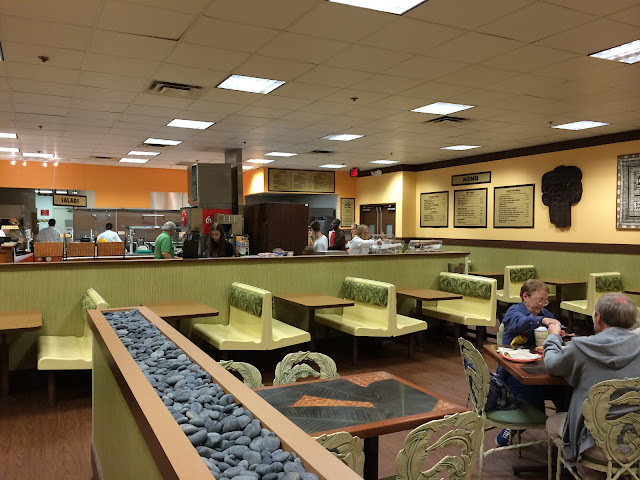 I snapped this shot of the temporary Captain Cook's while visiting the Polynesian tonight. Every so often, I find myself face to face with a Disney character. Such an occasion occurred earlier this week, as I was walking from Fantasyland to Tomorrowland. Both Pooh and Tigger had just come "onstage" from behind Cheshire Cafe when I had this brief encounter. This is one of the true benefits of using a cell phone as your camera, as it is easy to take a quick shot like this. Today we say Happy 25th Anniversary to Hollywood Studios. The third Walt Disney World theme park opened on May 1st, 1989. Today, I attended a special ceremony commemorating this important day in Disney history. As part of the event, they created a new "handprint" in cement block, like those seen in front of the Chinese Theater. 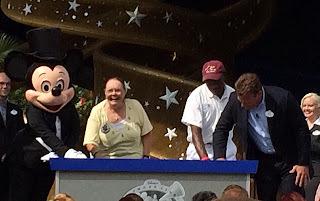 This one featured a guest who was here on opening day, a 25 year cast member, the VP of Hollywood Studios, and Mickey Mouse. I snapped this shot as each of them was pressing their hand into the cement.